UAF's Carl Tape will be speaking on Tuesday night in Fairbanks about his research into an elusive 1904 magnitude 7.3 earthquake that happened, we now believe, somewhere near Lake Minchumina. This is a detective story. Imagine an earthquake felt all over Alaska, recorded on seismic instruments around the globe, and nobody knowing where it happened. The mystery offers a fascinating window into the early days of earthquake monitoring. The earthquake occurred at the dawn of the instrumental era and remains the fifth largest earthquake recorded in mainland Alaska. 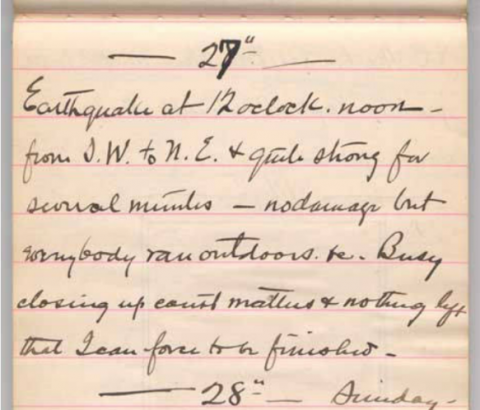 To narrow down its location and propose a likely fault, Carl and his co-authors looked at the 1904 seismic data along with felt reports from sources such as newspapers and weather observers across the state. Please join Carl to learn more about the earthquake and about how researchers today use every available technique to understand earthquakes of the past. The talk is part of the 2017 Science for Alaska series. If you can't make it, you can read Ned Rozell's piece on the earthquake here.